The two international instruments that have a direct influence on the development of the linkages between health and biological resources are the World Health Organization (WHO) and the Convention on Biological Diversity (CBD). Their goals intersect in areas related to ensuring availability of medicinal resources, and the role of traditional medical practitioners/communities in using these resources to provide health care. While the CBD recognizes the rights of communities over their knowledge and practices, the WHO’s focus has been on ensuring safe and effective health care to populations, especially to those whose first point of contact for health delivery is a traditional healer. However, official documents of the WHO focus on setting standards for national health systems, with limited guidelines for community level health practices. It is important and quite urgent that the organization provides such advice. The decision X/20) of the Conference of the Parties to the Convention on Biological Diversity (CBD-COP), which calls for cooperative action between relevant organizations to promote health and biodiversity goals is a step in the right direction. The increasing cooperative activities initiated between the CBD and the WHO are a welcome development. Strengthening linkages explicitly between biodiversity conservation and health goals have gained increasing emphasis since the COP-10 of the CBD (Decision X/20). The cross cutting initiative on biodiversity for food and nutrition as per CBD COP decision VIII/23 can be viewed as a precursor to this. The different dimensions related to biodiversity and health objectives are captured across various goals and targets of the Aichi Targets of the New Strategic Plan of the CBD (Targets 4, 5, 7, 12, 13, 14 and 18). This was strengthened by decision 16 of the Sixteenth meeting of the Subsidiary Body on Scientific, Technical and Technological Advice Subsidiary Body on Scientific, Technical and Technological Advice (SBSTTA) that brought out specific linkages between achieving health targets and achieving the Aichi Strategic Plan targets (UNEP/CBD/SBSTTA/16/16 ). COP-11 decisions XI/3 on co-operation between different international organizations, XI/14 (on Articles 8(j) and 10(c) and XI/22 (poverty and development) further accentuate the need to address development priorities with conservation priorities at the local level. Attached to the Aichi Strategic Plan there are a number of indicators relevant to biodiversity and health including trends in benefits that humans derive from selected ecosystem services, trends in health and well-being of communities that depend directly on local ecosystem goods and services, and trends in the nutritional contribution of biodiversity and food composition. The COP-11 requested that these indicators be developed further and used by different stakeholders. 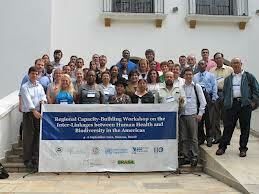 In line with this, following an initial CBD/WHO workshop at WHO Headquarters in April 2012 in Geneva, Switzerland, the CBD Secretariat (SCBD) and the WHO initiated collaborative activities with regional workshops in September 2012 in Manaus, Brazil. Within the first regional workshop on the inter-linkages between human health and biodiversity in the Americas, the 52 participants from 25 countries agreed on 17 groundbreaking activities to address related issues. The SCBD in collaboration with the WHO convened a meeting from 15-16 January 2014 at WHO headquarters in Geneva, Switzerland to initiate discussions for the preparation of a joint study on the interlinkages between biodiversity and human health, together with key partners. The overall goal of the publication is to provide a state of knowledge review of the vital linkages between health, biodiversity and the life supporting services it provides, in the context of the post-2015 development agenda. This work builds on previous collaborative work between the CBD and WHO, including a technical workshop held in Geneva on April 2, 2012, as well as two jointly convened regional workshops on the interlinkages between biodiversity and human health for the Americas and for Africa, respectively held in Manaus, Brazil (4-6 September 2012) and Maputo Mozambique (2-5 April 2013). It is additionally expected that the publication will contribute to the implementation of the UN-wide strategy for biodiversity, the Strategic Plan for Biodiversity 2011 – 2020 and its 20 Aichi Targets, and thus further strengthen and sustain collaboration between WHO and CBD as well as key partners working in the health and conservation sectors. The meeting gathered 25 representatives amongst others from the BaCH Initiative e.g. CBD, WHO and Bioversity International as well as from COHAB Initiative, DIVERSITAS, Ecohealth Alliance, FIOCRUZ, Health & Ecosystems: Analysis of Linkages of the Wildlife Conservation Society and the Harvard School of Public Health. The objectives were to: clearly define the structure of the state of knowledge review; further discuss biodiversity and health knowledge and linkages to be included in the publication; collaboratively examine common areas of scientific interest in light of respective mandates; and discuss respective contributions to the technical volume, roles and future collaborative steps. Several partners of the BaCH Initiative will contribute to this study. Part I will introduce concepts such as the social and environmental determinants of health, biodiversity and ecosystem services, and provide a broad overview of the different ways in which biodiversity and health are linked. It will also consider the common drivers of change that impact on both health and biodiversity, and examine approaches such as “One Health”, “Ecohealth” and the ecosystem approach that attempt to unite different fields. Part II will examine how biodiversity is related to specific thematic areas at the biodiversity-health nexus including: water and air quality; food and nutrition; infectious diseases; microbial communities and non-communicable diseases; physical, mental and cultural well-being; and traditional and modern medicine. Part III will explore how health and biodiversity policies and programmes can be improved in light of a better understanding of health-biodiversity linkages, and how these issues can be reflected in land use policy, climate change policy and disaster risk reduction. It will survey available tools for this purpose. The study will also take into account the possible need for science-based global, transparent and effective control and regulatory mechanisms, and attempt to identify gaps in existing scientific literature as well as policy gaps. The study will also include case studies that demonstrate the need for integration of health and biodiversity policies, particularly in developing countries.